This week I wanted to do a STEMI episode. But there is so much out there and admittedly better than I can do in a short 5-10 minute session. So here is a nice video about six minutes in length by HqMedEd.com that goes over two EKG case studies and how they relate to inferior ST elevation. Want to master EKG reading and propel yourself into a 12 lead ECG ninja? 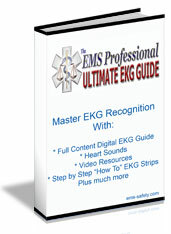 Click here to get the Ultimate EKG Guide and master everything from Normal Sinus to Heart Blocks and build a solid foundation in your EKG mastery. With winter on the way and actually here in some places. I thought it would be a useful idea to point out some changes seen in EKG readings with hypothermia patients. Check out this video (about 7 minutes) and leave your hypothermia tips and useful clinical findings below.